Last night I made friends. Like very nice people indeed. Spanish lady who likes to pretend to be quite mad and Dutch boyfriend who plays great music. I even brought out my 24 month old cheese for all to share and they thought it was the best cheese they ever tasted. But then the cheese is Dutch so of course they’d say that. And the lady is from Spain so maybe she actually is a bit quite mad. I met them in the place with the sailboat showing in the window. 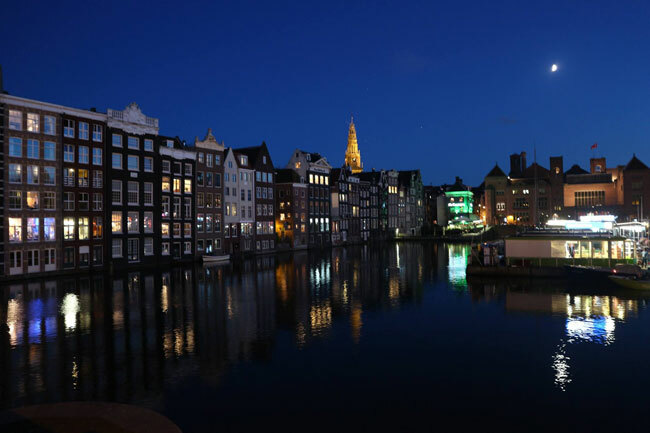 The lights beyond are Centraal. Then, as I was so chuffed with the ability to rest the camera on the bag on the bike seat instead of a tripod, and I figured how to quickly get auto timer to work on the Canon, I decided to take some nite shots. It gone gone cold today. Again the pictures are straight off the card. Zero edit, crop, retouch, rotate, etc. Straight off the card. This entry was posted in Summer 2016 Cycling Holiday by stujinnes@gmail.com. Bookmark the permalink.